UPR Pro-Series ™ Adjustable Upper, Lower Control Arm & Spherical Bushing Package brings together our best selling suspension parts for your 79-04 Ford Mustang. 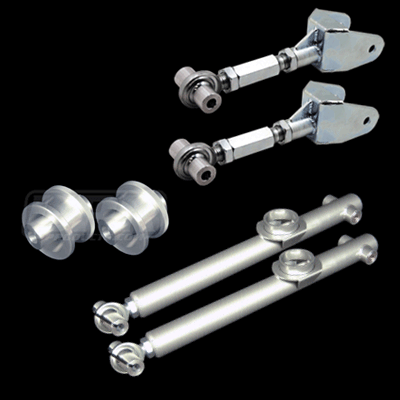 Both featuring Chrome Moly components for strength, durability as well as weight savings. The Pro-Series ™ uppers feature a threaded adjuster system allows these bars to be fully in car adjustable on the fly or between rounds in the lanes. The Pro-Series ™ lowers are single adjustable to set your rear end location properly and lock it in place. Billet Spherical bushing allow your rear upper control arms and rear end move smoother and faster for more traction and improved 60 foots. All of our Suspension Products are made with the Highest Quality materials and most expensive components. We spare no expense on our products and always stand behind them with our Lifetime warranty that no one else offers. Installs in 3 to 3 1/2 hours with basic hand tools.